Micromax A116 has been making news all over the internet. Some have touted the phone as being better than the Samsung Galaxy Grand, which is approximately Rs 6,000 more expensive. 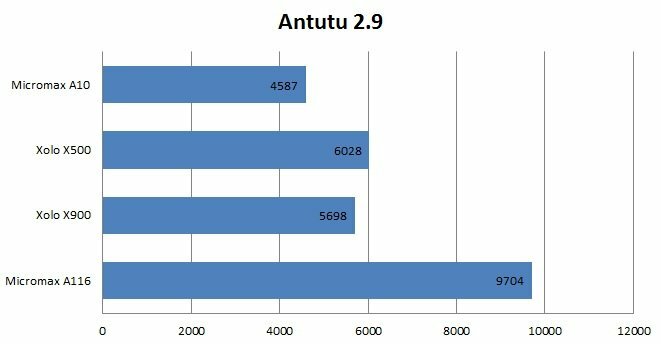 Well we finally have some benchmark numbers to see how that quad-core processor sitting in the phablet compares to its counterparts out there in the wild. The 1.2Ghz quad core Cortex-A7 Mediatek MT6589 processor in the phone is the most powerful offering from Mediatek yet and even though it won’t give Qualcomm’s top end any nightmares, it does hold its own very well. The phone easily beats the competition including Desire X and Galaxy Grand as far as CPU performance is concerned. Thanks to the quad core processor, the handset eats similarly priced phones such as Xperia U and the Xolo X900 for lunch. However when it comes to GPU performance, the PowerVR SGX544MP does fall behind the Galaxy Grand. The reason for this would be the higher resolution display on A116 compared to Galaxy Grand (720p vs WVGA). In the offscreen test both the phones performed similarly, however the Galaxy Grand was marginally ahead. Micromax A116 Canvas HD is definitely a solid product that delivers some serious performance at an affordable price. If you’re looking for a phablet on a budget, this phone can be considered as an option.